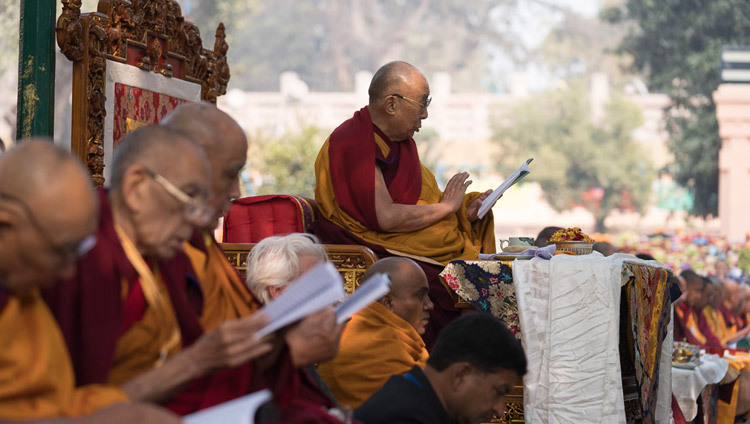 Bodhgaya, Bihar, India – His Holiness the Dalai Lama left the Tibetan Monastery under a sunlit blue sky this morning. He drove the short distance to the Mahabodhi Stupa, where the Great Prayer Festival of the Nyingma Tradition began today. 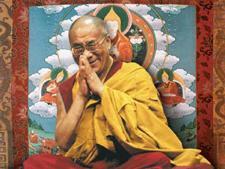 This was His Holiness’s third visit to the Stupa during his current stay in Bodhgaya. Once more he stepped through the stone railings surrounding the inner circuit on the west side next to the Bodhi Tree and walked round to the inner sanctum, where he paid his respects before the statue of the Buddha and lit a lamp. He then completed his circumambulation, smiling and waving to people gazing through the railings, and took his seat facing the Bodhi Tree and the Seat of Enlightenment. To his left sat Lamas like Kathok Getse Rinpoche and to his right the current Ganden Tripa and his predecessor and others. Hanging before them were two thangkas depicting the fourteen Dalai Lamas. Be uprooted by the truth of the Three Jewels. Back at the Tibetan Monastery His Holiness met with a group of 170 professionals from all over Vietnam. “Whatever your specific occupation, whether it brings benefit or does harm depends on your motivation,” he told them. “If you’re self-centred, working as a teacher may seem to be good, but the reality may be different. As I said, everything depends on your motivation. The Buddha always emphasised that we need to purify our minds, so we need to analyse what kinds of mental state are helpful and which bring us trouble. “Mental afflictions like anger, hatred and jealousy are harmful because they disturb our peace of mind. Medical researchers have also observed that constant anger and fear undermine our immune system. To reduce anger we need patience and tolerance, but the most effective step is to cultivate warm-heartedness. In addition, it’s important to think about the oneness of humanity—how we are all the same in being human. Because I think of myself as just another human being, with nothing special or different about me, whoever I meet I also think of similarly as another human being, no matter what their race, faith or nationality might be.